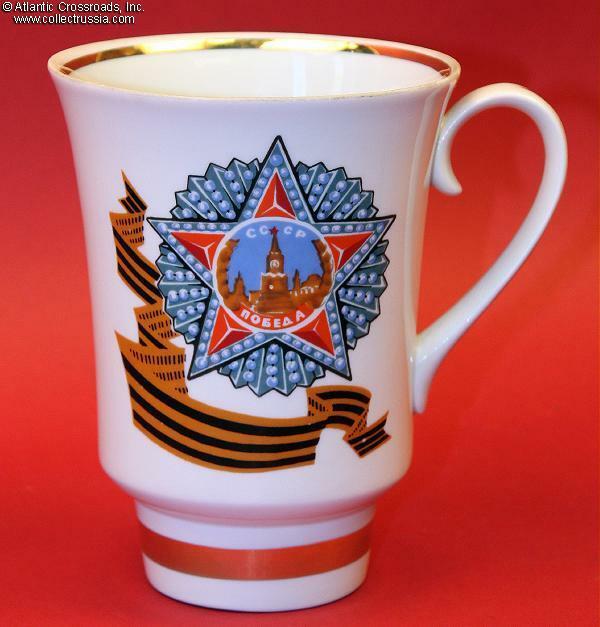 Commemorative Mug celebrating the Victory over Germany, Kiev Experimental Ceramic Factory, circa 1985. 6" (15cm), 2 1/2" (6.3cm) base diameter, 4 1/2" (11.5cm) rim diameter. Obverse features an image of the Order of Victory and a swirling length of Order of Glory ribbon. 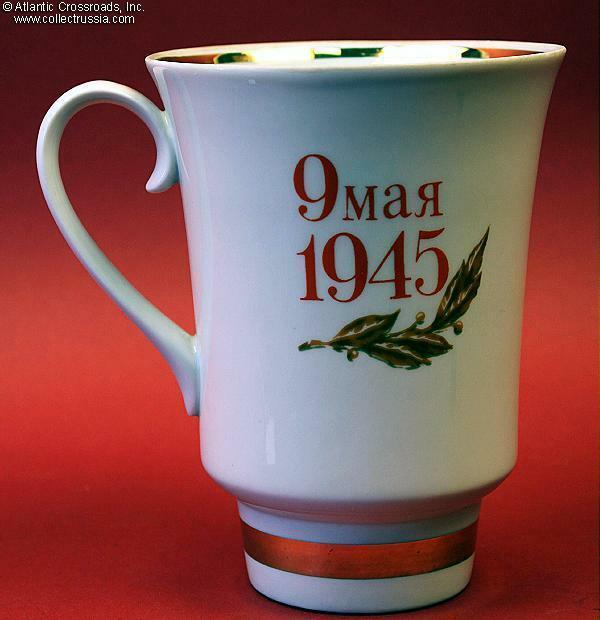 Reverse bears the inscription "9 May 1945" above a sprig of laurel.. Part of a Soviet 2 Ruble is still visible on the bottom. Excellent condition. No chips or cracks. Perfect glaze. 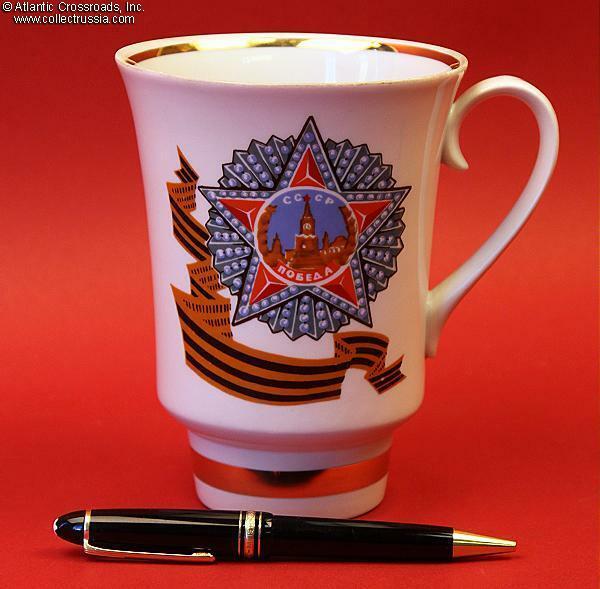 Rim has the typically matte/bisque finish that Soviet porcelain companies applied to tea cups; it has darkened very slightly but does not appear dirty. There are two or three tiny spots in the artwork that occurred when the design was applied at the factory. They do not detract, but could probably be colored in with an appropriately colored fine point art store marking pen if desired. 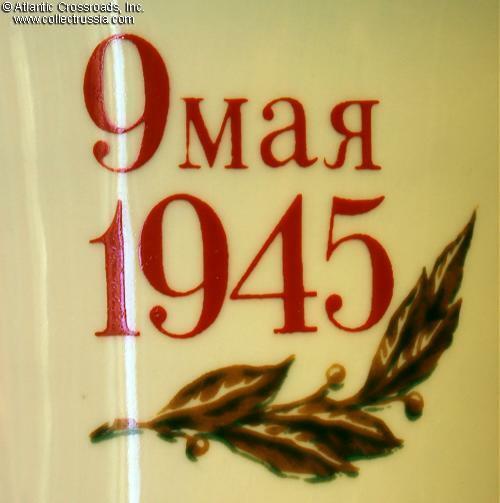 Carefully made and decorated, definitely once of the two or three nicest "Victory Over Germany" commemorative porcelain souvenirs that we've seen. 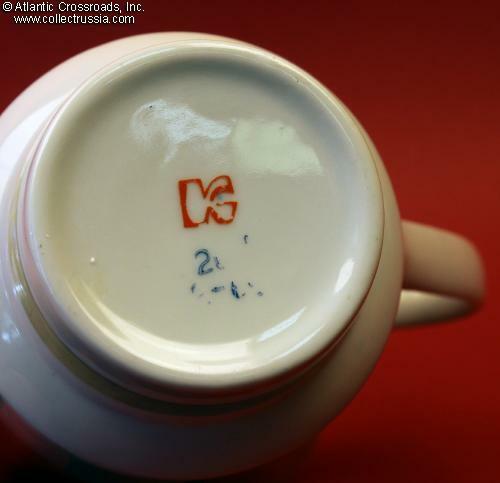 Trademark is #298 in Volume One of "Marks on Soviet Porcelain, Faience, and Majolica, 1917-1991"